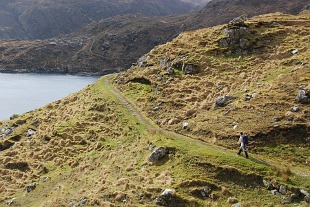 Before the road was built to Rhenigidale, the postman made his deliveries by a well-defined path involving some arduous climbs en route to and from the Tarbert to Scalpay road. This and other paths in the district have been maintained and provide interest as well as exertions. Take a look at the WalkHighlands details and be ready to explore, remembering that this is a one-way walk and so either a friend with a car, a bus timetable or a thumb for hitch-hiking are requirements.